Autumn House Press, 9781938769375, 64pp. 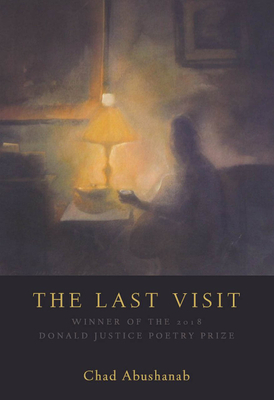 In Chad Abushanab’s debut poetry collection, The Last Visit, he carefully and compassionately explores a family broken by alcoholism and abuse. These poems trace the trajectory of an adolescent living with a violent father struggling with addiction, and recount both the abused child’s perspective and his attempts to reckon with his past as he reaches adulthood, chronicling his own struggles with substance abuse and the reverberations of trauma in his life. Amid the violence and hurt, Abushanab’s verse renders moments of compassion—even the least sympathetic figures are shown to be grappling with their flaws, and the narrator struggles to find compassion and move beyond the memories and habits that haunt him. These well-crafted poems explore how the past shapes us and how difficult it can be to leave behind. Chad Abushanab is a poet living in Iowa City, Iowa.